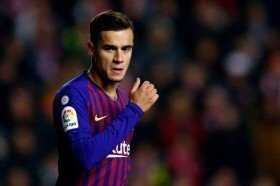 Chelsea have reportedly emerged as the leading candidates to lure Philippe Coutinho from Barcelona with the midfielder reluctant to pursue a move to Manchester United. The Brazil international has not enjoyed the best of performances in the Spanish La Liga since joining the Catalan outfit in January 2018 and reports have indicated that he could consider a move elsewhere. According to Sport, the 26-year-old would prefer a return to the Premier League during the summer after enjoying an impressive stint with Liverpool between 2013 and 2018. However, he is said to have reservations over a move to Manchester United owing to the club's fierce rivalry with the Reds and this could put Chelsea in the frontline to acquire his services. Chelsea are currently planning a replacement for Hazard, who could be heading through the exit door, but any move for Coutinho may depend on whether they can delay their transfer embargo until the turn of the year.